Rick Witsken didn’t need pickleball to come into his life. “Everything surrounding tennis was my life,” said Witsken, a two-time Indiana state singles tennis champion who also was world-ranked on the ATP Tour in singles and doubles. Witsken began his post-tennis career working with his brother, 1986 U.S. Open singles champion Todd Witsken, at the Indianapolis Tennis Center, serving as tennis director and coach of the IUPUI men’s tennis team. Todd died in 1998 at age 34 after a nearly two-year battle with brain cancer. Witsken, a Zionsville resident, founded Team Witsken Tennis 20 years ago after losing his brother. “I started my company to honor him in every way,” he said. Team Witsken has coordinated tennis programming in the greater Indianapolis area for 16 years. Witsken coaches indoors at The Retreat and offers summer programs in Zionsville, Carmel, Fishers, Mount Vernon, Westfield and other surrounding communities. He is the head coach of the Zionsville girls middle school tennis teams. 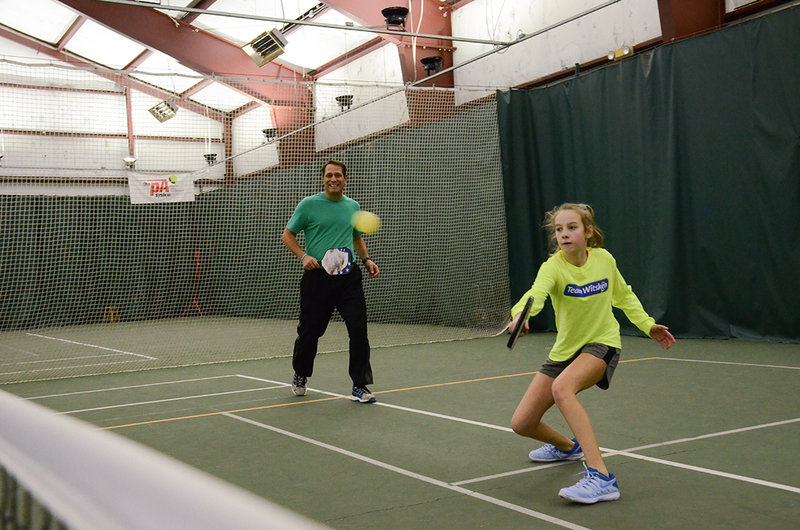 When Witsken was introduced to pickleball five years ago, he immediately loved it and soon began coaching. He now plays nearly 20 professional tournaments each year, earning prize money and sponsorships, and offers pickleball programs for all ages and levels through Team Witsken. This year, he will play a pickleball tournament with former U.S. Open and Wimbledon tennis doubles champion Ellis Ferreira. Pickleball combines elements of tennis, badminton and pingpong and can be played indoors or outdoors on a badminton-sized court and a slightly lowered tennis net. The sport is typically played with composite paddles with thin laminate faces, though some paddles are made from different materials. It uses a plastic ball with circular holes. Although there are many singles players, the game is largely recognized as a doubles sport. Witsken said the sport is quickly gaining popularity. He intends to lead the pickleball charge in Zionsville and surrounding communities. The sport is the fastest-growing in the U.S., with more than 2.8 million players and a 12 percent increase in 2018, according to the Sports & Fitness Industry Association. It is played in elementary schools, community rec centers, country clubs and other venues. Matthew Slatkin, an instructional designer who relocated to Zionsville last year, has been playing pickleball with his 12-year-old son, Ethan, for two years. Slatkin said there’s a reason why pickleball is the fastest-growing sport in the U.S.: accessibility. Slatkin, who is experienced in pingpong and tennis, said pickleball is more fair because it uses an underhand serve and also includes a 7-foot, non-volley zone called “the kitchen” which prevents people from using height to an advantage. The sport allows women, men and children to play together by minimizing physical dominance. Witsken said the court also is easy to set up. Ethan Slatkin said he enjoys the sport because he is shorter than most of his opponents but can still play well. “We play once or twice a week but I would like to play a lot more,” Ethan said. Ethan said he is proud of his personal achievements in pickleball and can beat his dad. Sue Gregerson, business director for the Zionsville Community Schools Special Projects Division, is an avid pickleball player and wants to see it grow in Zionsville. According to Gregerson, ZCS aims to add pickleball lines to a few tennis courts at Zionsville Middle School and Zionsville West Middle School. She said the goal is to add pickleball to the Eagle Recreation Enrichment offerings. The Eagle rec classes can be taken for a fee throughout the year in addition to regular school programming and range in subjects from art, music, foreign language, athletics and more. Paddle contact with the ball must be below the server’s waist. When the ball is served, the receiving team must let it bounce before returning, then the serving team must let it bounce before returning, thus two bounces. After the ball has bounced once in each team’s court, both teams may either volley the ball (hit the ball before it bounces) or play it off a bounce. Games are normally played to 11 points and won by 2 points. 1965 – Pickleball began as a backyard creation when a congressman, Joel Pritchard, and a businessman, Bill Bell, from Washington wanted to entertain their families. One man’s property had an old badminton court but they could not find a full set of rackets so they improvised and started playing with ping-pong paddles and a perforated plastic ball. The goal was to provide a game that the whole family could play together. 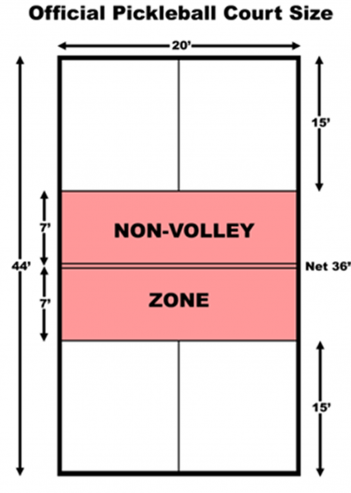 1967 – The first permanent pickleball court was constructed in the backyard of Pritchard’s neighbor, Bob O’Brian. 1976 – The first known pickleball tournament was held in Washington. 1984 – USA Pickleball Association was organized to perpetuate the growth and advancement of pickleball on a national level.